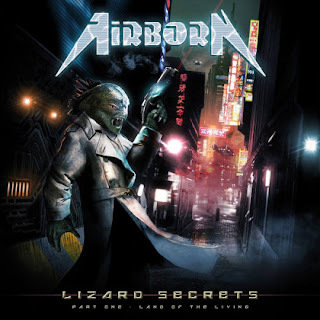 Βιογραφικό: «Emerged in 1995 in Torino (Italy), Airborn have released four albums: "Against the World" (2001), "D-Generation" (2003), "Legend of Madog" (2009) and "Dark Future Rising" (2014), plus a live album "Dinosaurs: 20 Years Live" (2016). Having played tours, shows and festivals with bands like Iron Savior, Fates Warning, Freedom Call, Masterplan, Paragon. Korpiklaani, Tankard and many others, Airborn have been building a solid reputation within the european Power/ Heavy Metal scene during their 23-year career. Album: "Lizard Secrets: Part One - Land of the Living"